Pre-event material, maps etc <. .< Race 1 . < Race 2 . < Race 3 . < Races 4&5 - Other pictures. Decreed that all participants would embark in powered vessels to the southernmost destination of Stensham, to overnight and return by ferry on Friday. 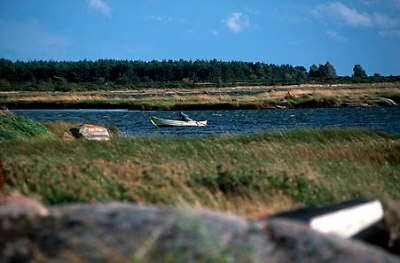 Smoothly organised, fantastic views of the wave-tossed Baltic, islands so low to the sea that they and their inhabitants seemed at risk of blowing away. The sail-minded navigators were spell-bound by the handling skills of the motor-boat skippers on this occasion: the harbour mouth at Stensham was hardly friendly in the storm. 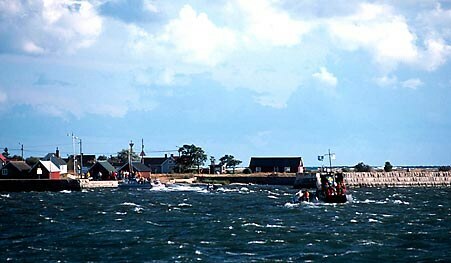 The following day the boats transferred, still in 20-25 knots, to Karlskrona under jib or heavy reef, with the sturdy Djarv in attendance. That was the day for Molly to try the trysail we thought about, but never brought! Molly doesn't ride comfortably under jib alone��. 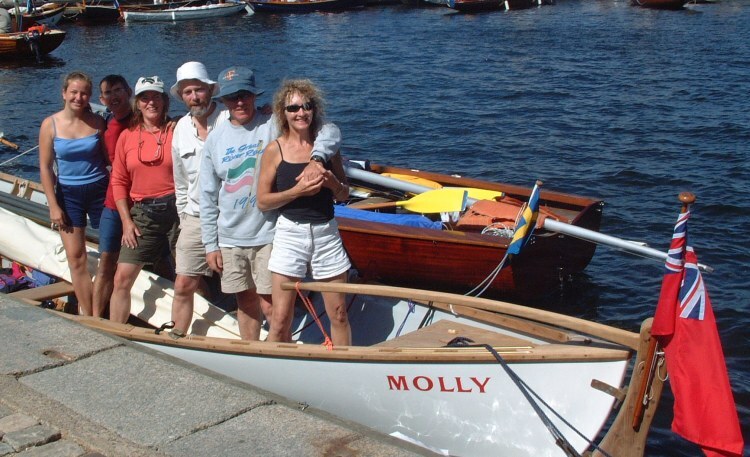 Arrival in Karlskrona means a rowing race (we won, with Kathy's expert steering) and a welcome end to camping, a return to soft pillows, duvets, showers on demand. Sleeping in the gale-bound church at Stensham (and the girls' sermons from the pulpit) is a distant memory after less than 18 hours! 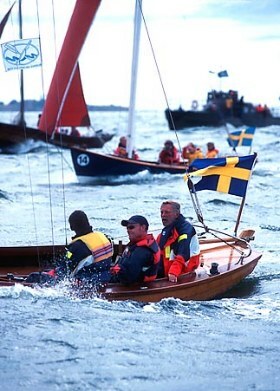 Finale - 16 August - Race 6 (and last) is around the main Karlskrona island of Trosso: a morning start, usually bad news for the sleepy Mollies, is better than usual, as the gales of the last two days are still an active memory in the sky, and the pre-start manoeuvres are much nearer to the departure from Hallevik than any recent event. Paul also introduces us to the charms of GPS time on distance: cross the start line going behind, punch the button as you cross, hold course for 200 metres, turn and run back to the line; compare 'time to departure' on GPs with 'time to gun' on the stopwatch, and everything seems extraordinarily easy! Another difference is that we are sailing light for the first time: no bundles of bedding, tents or clothes, and a determination to fly full sail if we can. Have we become ballast-junkies in the week, or can we hold her up on our own? After an excellent start, leaving everyone standing on the line, we sail into the lee of the island, heading south, and for half an hour we have returned to light airs tacking, and the blue and the yellow French boats slip past. But soon we have all tacked onto port, and the full breeze is coming at us around the bottom of the island: the struggle begins; two very light, modern designs from France and Molly representing the best of American artisan designs from the 1870s. An advantage to the whalermen soon emerges. 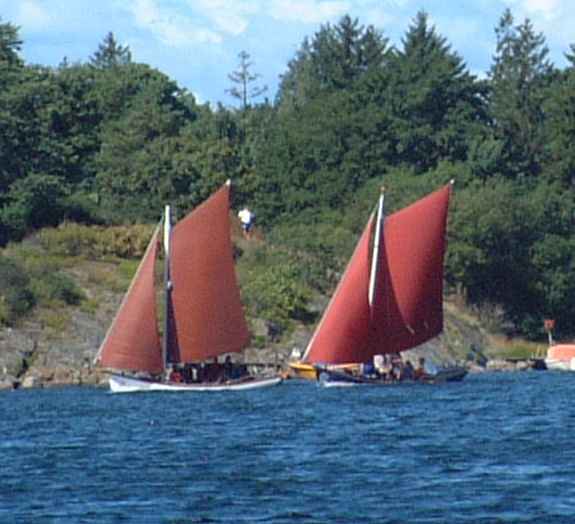 The clear wind from the SE rises to 20 knots, and the lighter boats cannot hold full sail. Both are luffing heavily in the gusts, while we pile crewmen onto and beyond the rail and wind in the mainsheet. (Willets D Ansell: The Whaleboat, p66: 'All (whaleboat) rigs remained simple and practical and put heavy reliance on man power and live ballast'. Yessir!) Windward speed builds and builds, and sets a record for the trip of 8.3 knots! There comes a critical moment when we are passing Cybellule for the last time, sailing through her lee, when Nee wants to ease the main and skipper grabs the falls and stops them running. Molly surges one more time and we are through! Sorry, Nee�At the turn to the NW we are 200 metres ahead. Then the wind went into the North, and Paul agreed we could sail inside the small island ahead if we hugged it shores. Our lead stretches to 500 metres: a right turn into an unpromising-looking inlet (Paul's navigation again); a period stalled with no wind between two towering granite rocks, a new breeze and a finish between the fountain and the faithful Djarv; Molly has done it: three firsts and three seconds, and first prize is ours! We are free to sail the landlocked sea, and watch the final finishing races of our companions unfold. 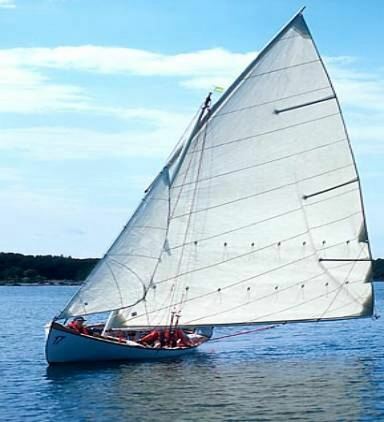 Sail so that stability upwind and on reaches is not an issue, but it is, in the mind, at least, sailing due downwind in heavy breezes. Gybing still needs practice and confidence-building! Gear, kept simple, is reliable: nothing broke in a week of first-time sailing: spars, sails, centre-board, sheeting and reefing arrangements were virtually untried before the raid, and stayed together. Pre-event material, maps etc <. .< Race 1 . < Race 2 . < Race 3. < Races 4&5 - Other pictures.